Today I wanted to share my favourite colours from this delightful Advent Calendar by Ciaté. 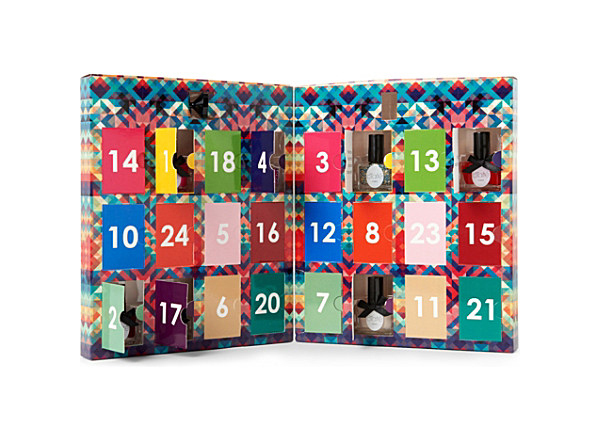 Yes, this isn't your typical advent calendar, filled with chocolates behind each of the 24 doors. Oh, no! This is aimed for the beauty junkies out there – like myself – who much prefer to get a little nail treat every day, from the 1st of December til Christmas Eve. So, the first colour that really appealed to me was Dangerous Affair, which is the perfect deep red, without being too deep – if that makes sense? This was the first Ciaté polish I've ever tried and it really surprised me by the fact that it dries quickly, lasts longer than my usual choices and has a creamy finish. I was even patient enough to let it dry completely before I put on my top coat – which never, ever happens. My next two faves were behind doors 11 and 12, and they belong to the same shade range – black and gold – which I tend to prefer. Bumble Bee is the most wearable Caviar Blend from this collection, in my opinion. It has gold and black pearls, which look amazing on top of any black polish. You can use this on all of the fingers or just as an accent, on the ring finger. This is really easy to use, by the way. You just need to pour the pearls over a coat of wet polish (be sure to have something underneath, to catch the pearls that fall off) and delicately press them down. Then, seal the tips of the nails only, with a top coat of your choice and pour those little pearls that fell off back into the bottle, with the help of the funnel. Don't need any amazing skills here! The other shade is Twilight, which is a black with tiny gold flecks – my number one fave in the whole collection. This is so beautifully opaque and you don't lose the black within the gold. It's basically what I hoped the YSL No. 126 Black Bronze, from the The New Blacks collection, would be. Yes, it has more gold flecks in it, but in the bottle it looks like a beautiful bronze black and when you paint it on your nails, it appears to be more of a brown shade. I still like it though! My fourth pick from the calendar is Fade to Greige – just a classic, sophisticated shade. It's perfect to use when you don't want anything too bright or if you're afraid that your nail colour will clash with your outfit – personally, I don't really care. It's ideal for an interview or to use when you just can't decide on a colour. The final polish is Enchanted Rose, a brilliant glittery red, which is absolutely perfect for the holidays. And how appropriate is it that it was behind door number 24? Although I didn't use it on Christmas Eve, because I painted my nails in advance, on the 23rd. But still tried it on a few days after and loved it so much that couldn't stop staring at my nails like a crazy person... Hah!